DHA highlights Smart Home Healthcare Services at Arab Health 2019. 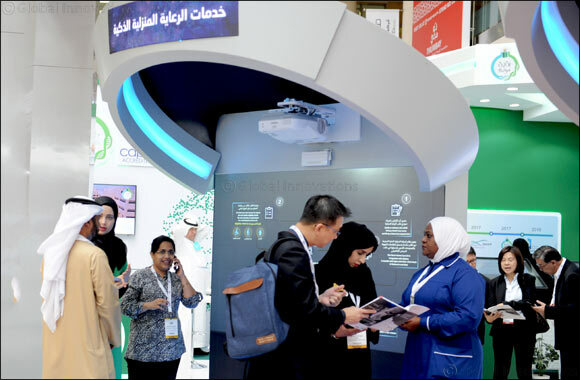 Dubai, United Arab Emirates, January 29, 2019: The Dubai Health Authority (DHA) highlighted its smart home healthcare services at the 44th edition of the Arab Health Exhibition and Congress. The service is part of the overall home care programme. The move is in line with the Authority’s vision to enhance its home care programme and utilize smart technology in the emirate’s healthcare landscape. DHA has seen a steady rise in the demand for home care services. From 300 patients almost two years ago to more than 1300 patients in 2018, the rise has been multifold. She added that the introduction of smart technologies is expected to increase efficiency by 50 per cent and reduce waiting time for getting specialist consultations. They also include wireless devices that are directly linked to DHA’s electronic health record system, Salama, ensuring that patient records are updated in real time during home visits via a secure web server. The DHA also uses a plethora of wireless devices such as non-contact thermometers, auto-arm blood pressure monitors, 4G routers, smart tablets, pulse oximeters, connected pocket electrocardiograms, blood glucose monitors, wireless stethoscopes and a digital scope system. Dr Taryam said electronically linking the devices to Salama ensures the accuracy of data and allows healthcare specialists to keep track of patients’ overall condition and routine health consultations or assessments from the comfort of their homes instead of having to visit healthcare facilities. ““Directly linking the devices to Salama also ensures compliance to documentation and well-coordinated care, which is critical for patients who see multiple clinicians through computer-integrated medical devices,” said Dr Taryam. Incorporating smart technologies in healthcare is an important priority as it enhances patient care, ensures better follow-up and empowers patients,” she added. The Smart Home Care project is the first-of its-kind in the Middle East and North Africa to utilize wearables and IoT devices to address the needs of the geriatric and bedridden patients. The project bridges the gap between healthcare service delivery and patient needs. It serves as a uniform solution that can be used under various home care scenarios and settings. By adopting this smart technology, Dr Taryam said that DHA will improve the quality and safety of care provided to patients, accessing physician care more efficiently and timely, thereby enhancing positive patient outcomes. The Home Care team reviews the request form and verifies eligibility criteria. The team schedules an appointment for a multidisciplinary home visit. Home Care team visits the patient, completely assesses the patient and documents the assessment on the Salama (electronic patient medial record) system. The Smart Home Care kit is integrated with Salama. It records vital signs and other client tests in Salama in real time. Physician schedules follow-up visits as per multidisciplinary care plan. Discharges the client as per criteria.